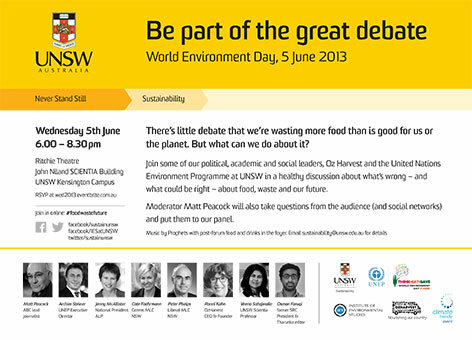 Think.Eat.Save was the name of the UNSW World Environment Day seminar that attempted to draw attention to food waste. This it achieved to some extent but having representatives of the three main political parties on the panel turned it into something of a recitation of known attitudes to climate change and the value of markets rather than to initiatives in reducing the $5.2 billion value of Australia's food waste every year. Only two speakers had something substantial to say about food waste and they were people doing something practical about it. One was young UNSW scientist Veena Sahajwalla who showed the audience building material her team had developed that is made from food waste — from the inedible macadamia nut shell. That's seeing a problem in one area as a solution in another. The other was OzHarvest founder, Ronnie Khan, whose organisation has salvaged tonnes of food wastes to feed needy Australians. Pointing to other practical initiatives in food education was Randwick Greens councillor, Lindsay Shurey, who in her welcoming speech highlighted the three Eastern Suburbs councils' successful Compost Revolution which has attracted 5000 participants in the region who reduced waste to landfill by 400 tonnes and has now been taken up by local governments in Victoria and elsewhere in NSW. She went on to talk about the Randwick Sustainability Hub, the community education program that includes courses and workshops in community leadership and food, including the long-running Organic Gardening course and the new course in Food Forest Gardening offered by council's sustainability unit, the opening of council's Permaculture Interpretive Garden as well as council initiatives in community and school gardens. Later, student leader Osman Faruqi adressed this, saying that the age group are generally climate progressives and students in that age group don't have the money to shop at farmers' markets and other fresh food suppliers, and that this accounts for their preference for fast foods. It would account for the presence of fast food corporation, Subway, on campus which, it was reported, is now participating in the university's food waste program. Cate Faehrmann, Greens Member of the NSW Legislative Council, tilted a little off course towards climate change in her initial comments, making the link to global food supply rather than focusing more on the theme of the evening — food waste. ALP National President, the young Jenny McAllister, didn't even mention the federal government's National Food Plan. Student leader Osman Faruqi spoke about university initiatives and the potential role of youth in addressing food waste issues. Ronnie Khan challenged the figure of $5.2 billion of food wasted every year in Australia, saying it was more like $7.8 billion worth. Her work in food rescue, of turning waste into nutrition, gave her figure credibility and clout. Bravely appearing on stage to round out the political spectrum was neoliberal economic fundamentalist in the NSW Legislative Council, the Liberal's Peter Phelps. While Peter made some good points, his responses seemed more faith based (faith in markets, that is) with repeated incantations common to the free market cult, that the market would solve all if only government would get out the way. He's also a member of the fringe group, the climate skeptics, though at one point he had to explain that he believes climate change is actually happening, only its not due to human causes. To judge by comments coming from the audience, there was a level of skepticism about Peter's belief. The market can provide solutions but it has to be an actual free market that offers opportunity to all businesses, especially small and medium food businesses. That's difficult in a national grocery market in which the supermarket duopoly controls an 80 percent share and engages in questionable procurement and competitive practices. I wanted to ask Peter how he reconciled his notion of free markets with that of Adam Smith, who I believe was critical of monopolies. Peter's right, too, in saying that government can impede innovative initiatives and business, however his solution of it simply getting out of the way ignores the necessity of it acting to open up economic opportunity to small to medium food business by dealing with the allegedly uncompetitive practices of the duopoly. Peter had more to say on the dominance of Australia's supermarket duopoly. Colesworth sell unblemished apples because their considerable market research discloses that this is what customers want, he claimed. Anyway, there are alternatives to the duopoly, he told the skepical audience. The market, after all, would solve whatever the problem is. Ronnie Khan responded by talking about the impact of the market, referring to the fate of Australian fruit growers and of the canning industry and that we need to "look after our own farmers" by buying local and seasonal. She said the supermarkets decline "masses of products" and this leads to food waste. Her call was for all of us to take personal responsibility for our food choices. Interesting though they are, the thing with these types of events is that they only skim the surface of issues and there's no opportunity to delve deeper into the thinking of the speakers. I heard this voiced over food and wine in the foyer. I can't help but think that having all those politicians on the panel was less than useful. Politicians, we know, have greater speaking rights than others. If they wanted to utter something public about food and waste they could easily issue a media release that would more than likely get mainstream media coverage. There are people out in the world doing a lot more about food supply and food waste than the major political parties and having those people talk about their technologies and projects instead of professional politicians would have been better. Was there a speaker from the Compost Revolution? No. Was there a speaker from Sydney Food Fairness Alliance? No. Was there a speaker from the university to talk about that institution's own waste reduction program? No. Was there one from the Australian Food Sovereignty Alliance? No. Was there a speaker from the state government's Love Food Hate Waste program? No. Perhaps this is nothing more than a reflection of institutional thinking by universities. Even though they can be innovators (an example being professor Veena Sahajwalla and her work), universities are often businesslike institutions, so perhaps we shouldn't expect more from them than asking mainstream politicians along. I, for one, expected more to do with innovation and positive examples of initiatives in the field of waste reduction and, from feedback, so did others. The event was billed on the UNSW website and in its publicity as a UNSW Sustainability and the Institute of Environmental Studies hosting of a "Q&A-style Town Hall debate". It really wasn't a debate at all and was nothing like a Town hall public meeting... it was more the same question being put by the host to all of the speakers on the panel, making it a speaking opportunity for people who already have plenty of opportunity to do that. As is common with such events, time allocated for questions from the audience was too short and the host made it clear that questions from the audience and answers by the panel were likewise to be short. There were more potential questioners than the time allowed for them. This was unfortunate. During audience question time, a conservative rose to say that not all conservatives share Peter Phelp's attitudes. And following that, a 17 year old asked the speakers what someone his age should do by way of useful work in the world. Responses from the panel were varied and perhaps not all that helpful, though I found Ronnie Khan's the best by far. She advised the questioner to discover his passion and act on that by way of his life work. That was less about seeking a career and more about finding the young man's vocation. Oh, and Peter Phelp had a solution and it was this: to avoid any work that involved dependency on government. That immediately brought a response from another of the speakers: "Like politicians, do you mean Peter? ".